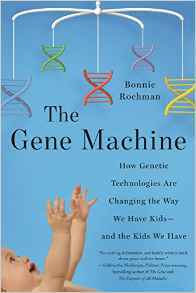 Bonnie Rochman is the author of the new book The Gene Machine: How Genetic Technologies Are Changing the Way We Have Kids--and the Kids We Have. 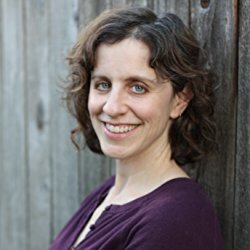 She was a health and parenting columnist for Time magazine, and her work has appeared in a variety of other publications, including The New York Times Magazine and The Wall Street Journal. She lives in Seattle. Q: Why did you decide to write this book, and how did you decide which areas within the field of genetic technology you wanted to focus on? A: I decided I wanted to write a book because I had written a lot about genetics, ethics, and children when I was writing for Time magazine and Time.com. I was writing for their health vertical and it was a time, it’s still a time, when there was so much demand for copy that there was not a lot of oversight from editors with story assignments. My marching orders were [to focus on] the intersection of children and health. I started in 2010—there was a lot of information about how new genetic tests were offering information that had never been available. I had kids, the oldest was 8, and the new tests were not available when I was pregnant. You were even able to determine the gender earlier. I realized as the tests were being developed there were serious ethics issues—is it a good idea to know these things earlier?...I wrote about genetics a lot. In 2012 I did a week-long series on sequencing children’s genomes. It was the last cover story in 2012. When you take on a big project and finish it, you either never want to write about the story again or you [want more]—I was the latter. It served as the foundation of the book. Q: So were the areas you focused on in the book determined by the stories you wrote? A: The stories were about sequencing children’s genomes. That’s part of the book. But I wanted to look at having a baby and the lifespan of having a baby, from before conception through childbirth and raising children, and how technological changes [affect it]. Q: How did you research the book, and was there anything that particularly surprised you? A: I already laid a lot of the groundwork at Time. I had interviewed geneticists, maternal-fetal medicine specialists. I had a foothold in the area. But then you do one interview and end that by asking if there are any suggestions for people who are good to speak to, and they turn you on to a family or a researcher. It’s almost like hopscotch, one source and another. I went to a genetics-related conference; it was a window into the world doctors are grappling with. Q: Was anything you found especially interesting, or was all of it fascinating? A: Everything is so new; the field is changing so quickly. There’s no shortage of surprising things. I was surprised and impressed by a rabbi I interviewed—he was dogmatic. He will not marry a couple unless they agree to have genetic screening to see if they’re at risk for transmitting genetic diseases. It’s one thing to recommend that but he takes it to another level to say, I won’t officiate at your wedding. I admire that. He seemed to be unique in his field—he’s having an impact on families he’s having contact with. Q: In the book, you discuss the concept of Pandora’s Box as it relates to genetic information, and you’ve alluded to that earlier—can you say more about that? A: All the information is really amazing and I’m a believer that knowledge is power. However, knowledge can induce a lot of anxiety. That’s where you have Pandora’s Box. Let’s say five years in the future, or 20 years in the future, sequencing your fetus is normal, like you have HIV tests all pregnant women get, and you find out all this information about your fetus. So much of what you learn is not definitive but [indicates] increased risk. What do you do with that information? Does it make you feel more empowered to know what diseases to be on the lookout for, or does it just make you more nervous? So much has to do with your personal level of comfort with information. A lot of people only deal with what’s certain and true; others like to sift through tons of information. It’s a very individual choice and is a decision parents are going to have to make. Q: You’ve mentioned Down Syndrome, which you write about in the book. What do you see looking ahead? A: It’s such a fascinating time. What makes Down Syndrome such an interesting test case in my book is now you can detect Down Syndrome earlier than ever, and also it’s the best time to have Down Syndrome or a child with Down Syndrome in history. There’s early intervention, there’s a lot of research going on, there’s people with Down Syndrome living into their 60s. How do you square that circle? You’re giving people information to potentially end a Down Syndrome pregnancy—and yet people who choose to continue are finding more support than they’ve ever had. With so many people working on potentially silencing the extra chromosome, or working on ways to enhance intelligence, it seems a better time than ever to have Down Syndrome—there’s more support and researchers working on it. Science by design is a very laborious, and evidence-oriented, discipline, and it moves very slowly. Yet there’s a lot of promise on some of the therapies scientists are working on. It raises the question, if you’re the parent of a child with Down Syndrome, how do you feel about these therapies? Do you want to change your child? Different people feel very differently. Some feel if they were [going to] improve cognition and memory, that’s not changing their child, just helping them function better. Other people feel it would be fundamentally changing their child’s nature. It’s an individual decision. A: I eat, dream, and sleep this book all the time! This is my first book—I’m still mired in this book…I have been a freelance writer for the past several years, and I will take some of the stories I couldn’t fit in the book, and try to have them see the light of day. One of the most important things about writing a book—I thought I could fit everything in, because it was a book! It was not a thousand-word article! But I was stunned at the amount I could not squeeze in. I have great stories that could not fit in the book. A: I hope this book will not be taken as a big scary book. The era of the genome, in which we live, is an incredibly exciting time, and I feel that there are so many opportunities to learn more about ourselves, our families, our children, the nature of who we are and how our bodies work. The caveat is that we have to so with care and caution. This is intended to be, Wow, look at all these amazing things we can know that we never had a clue about.